For the first time in what seems like an age I’m in the centre of town and I had some time to kill so what better way to kill it than by having lunch. Now I’ve visited Bone Daddies for a whole 10 minutes en route somewhere else, I had time to polish off a beer and a morsel of fried chicken (which was lovely) but i’ve been seeing pics on twitter of the totes amazing ramen they do and had to try it. So with a seriously rumbly tumbly i crept in and hoped they had space for a little one. It’s so uber trendy I was concerned I wouldn’t be allowed in, but being the super cool dining alone kinda person that I am I was shown to a table within 5 minutes. Soft shell crab was my first thought – well actually the rather amusing wording pasted at the bottom of this post was my first thought. 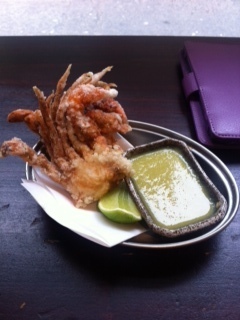 But then soft shell crab. And, it was only £8 for 1 1/2 crabs, they were just so yummy and juicy! 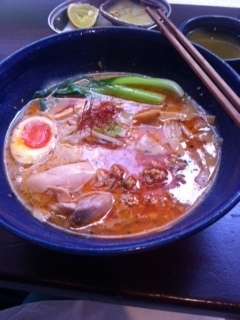 Then I went for the Tantanmen 2 which was noodles, chicken mince and a bit of chilli with bok choi. It was so good. And a pretty huge portion – I couldn’t finish it (me, yes me, not able to finish something). I love the presentation and the gorgeous posh soft boiled egg in there too. All washed down with green tea. Very satisfactory at £24.75 – ok, slightly more expensive than a sandwich from Pret but oh so so so much better. Oh and the Aussie waiter i chatted to about my book was pretty cute too. Would definitely go there again – and I’ve remembered how much I like to have the odd treat lunch table for one ever now and then!